The first of the photos below shows a tooth that had a cavity on the side, right where it touches the next tooth, and this tooth is prepared for a silver amalgam filling. The way that preparation is done, all of the weak tooth structure has to be removed. As you can see, a lot of the tooth has to be cut away. 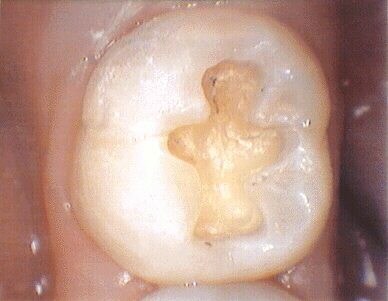 The photograph below, however, shows how much more conservative we can be when we use a bonded white filling. We drill down to the tooth decay, and bond the filling to the tooth. This way, we don’t have to cut away the entire side of the tooth. Click here to read about white fillings for teeth. Two photographs below illustrate a preparation on the chewing surface. In the preparation for a silver amalgam filling, all the susceptible grooves are cut away, and we have a reasonably large filling for a fairly small cavity. 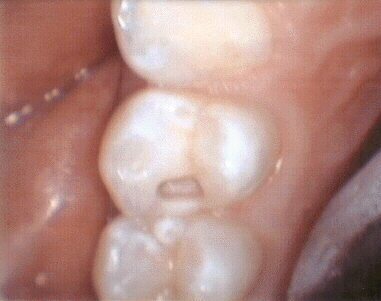 But this is the procedure that is necessary to properly fill this type of cavity with amalgam. 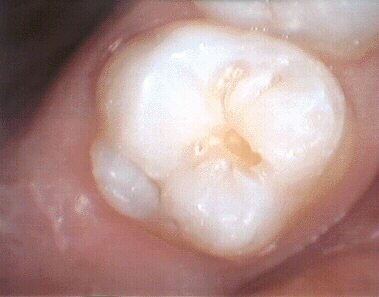 However, if we are placing a bonded white composite filling, we just drill away the decay. 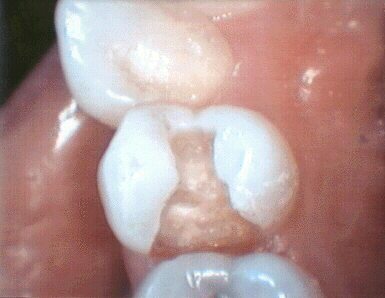 The rest of the tooth surface that is still susceptible to decay is merely sealed with a thinner form of the composite. Again, less drilling is the result. Can you put composite over amalgam fillings?